Molly Megan '19 is the first Student Picks curator for the 2018-2019 academic year. She is a senior Geosciences major and part of the Education Department's Museum Volunteer Program. Her show explores the myriad approaches artists have to representing the natural world. 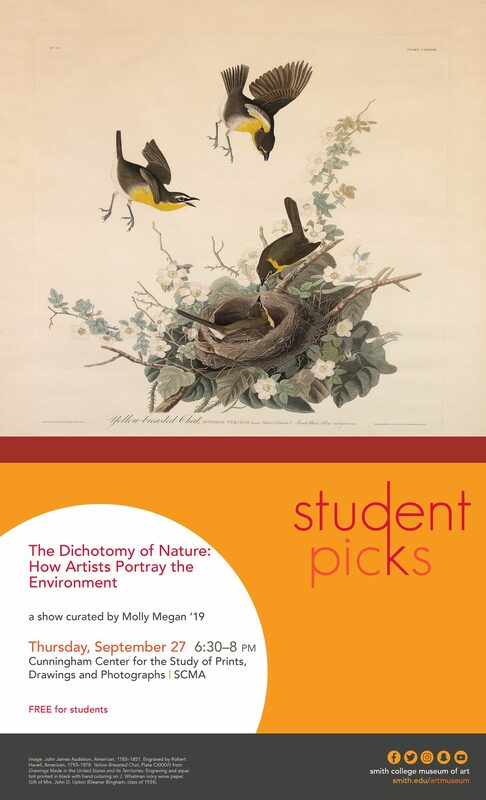 "The Dichotomy of Nature: How Artists Portray the Environment" will be on view in the Cunningham Center on Thursday, September 27th from 4:30pm-8pm. Student Picks is part of this year's inaugural Thursdays 'til 8 program, Salon de Septembre, an exclusive first look at "Becoming a Woman in the Age of Enlightenment: French Art from the Horvitz Collection." The famous naturalist, John Muir is credited with saying: “In every walk with nature one receives far more than he seeks.” This show explores two dramatically different depictions of nature with the hopes that you, the viewer will find more walking through this show than you were seeking. Audubon’s prints are careful reproductions of the natural world, demonstrating how artistry and scientific study can meld to capture an animal’s morphology and natural environment. The landscapes in this show offer a different approach to depicting nature, focusing on the emotional essence of a scene rather than transcribing a specific place. When viewed together, both bodies of work demonstrate that whether accurate representations or dramatic interpretations, works about nature can evoke feelings in all viewers, connecting them with the world around them. I have always been interested in how conservation and the natural world are depicted through art. One of my first experiences at Smith was a field trip to the Smith College Museum of Art to view Audubon prints with an Introduction to Biology course. As we were looking at the Audubon prints, we examined the accuracy of the animals in their natural environments. The purpose of our visit was to discuss the intersection of science, specifically ecology, with art. For this show, I wanted to show the dichotomy that exists when representing nature. Artists can choose to represent nature in a way that evokes emotions from the viewer rather than making the viewer feel as though they are looking at a specific location. While the landscapes were meant to represent how a person feels when in nature, the Audubon prints were meant to educate people about animals that they likely would never have the chance to see in the wild. Despite the two very different approaches and styles, both aim to draw the viewer in to experience nature.